It's Fri Apr 19, 2019 - 20:02 in Beirut. The Brass Crescent Awards, a joint project of altmuslim and City of Brass, is an annual awards ceremony that honors the best writers and thinkers of the emerging Muslim blogosphere (aka the Islamsphere). Nominations are taken from blog readers, who then vote for the winners." "What are the Brass Crescent Awards? They are named for the Story of the City of Brass in the Thousand and One Nights. Today, the Islamsphere is forging a new synthesis of Islam and modernity, and is the intellectual heir to the traditions of philosophy and learning that was once the hallmark of Islamic civilization - a heritage scarcely recognizable today in the Islamic world after a century's ravages of colonialism, tyrants, and religious fundamentalism. We believe that Islam transcends history, and we are forging history anew for tomorrow's Islam. These awards are a means to honor ourselves and celebrate our nascent community, and promote its growth." This year, the jury decided to give the award for Best Mideast/Central Asian Blog to Raising Yousuf, Unplugged (Laila El-Haddad). El-Haddad is a Palestinian journalist who divides her time between Gaza and the United States, where Yousuf's father, a Palestinian refugee who is denied his right to return, resides. 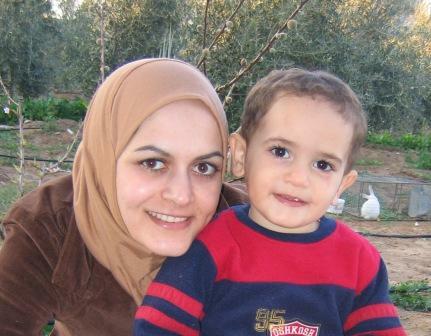 "This blog", El-Haddad says in her profile, "is about the trials of raising our son between Gaza and the US, while working as a journalist, and everything that entails from potty training to border crossings. Together, we endure a lot, and the personal becomes political. This is our story." Laila El-Haddad with Yousuf. R.R. The overall 2007 Best Blog Award - "the most indispensable, Muslim-authored blog there is. Period" -, as well as the Best Female Blog Ward, went to Spirit 21 (Shelina Zahra Janmohamed). Nominators call Shelina Janmohamed's Spirit 21 "intellectual without being overbearing" and "insightful". Spirit 21 is Shelina Zahra Janmohamed, a Muslim girl living in London. "They say that there is a glass ceiling for me because (as Michael Moore would put it) I am not a stupid white man. Another they says I should temper my passions and desires, my dreams and ambitions because I am not a brown be-turbaned man. Some Theys say that I should fight my oppression, that I should rout it and defy it. Some say I face no oppression, that I should be happy that I am blessed and should accept my fortunate and happy lot. If you are not with us, they say, you are with the others, and they are wrong. "Spirit21 is a space to bring colour to this monochromatic world. I don't believe that black or white are the only options. Why not pinks, blues, yellows or browns? I am not us, nor am I Other. The Most Deserving of Wider Recogition Award - "a true diamond in the rough, one that everyone should be reading but who most just haven't heard of (yet)" - went to the The Islamicist, "a comic talent in the making who writes the funniest post this year in a post-9/11 confessional." Check out some of the other winners and nominees on www.brasscrescent.org.